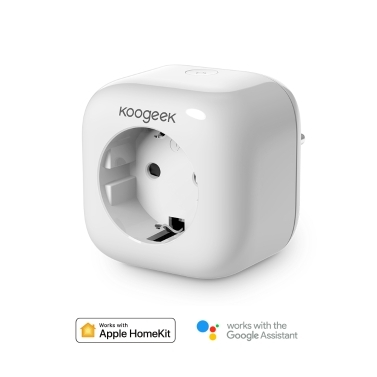 Koogeek Smart Plug is a Wi-Fi-enabled smart wall plug that works with Apple HomeKit and the Google Assistant, and compatible with Alexa. 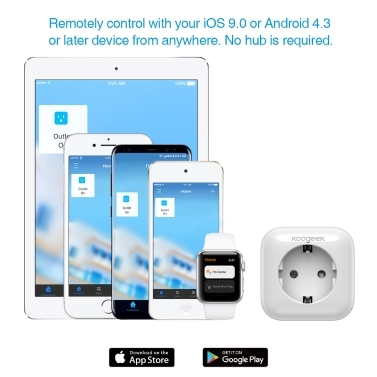 You can remotely control and monitor the connected device by using Koogeek Home app (available on the App Store and the Google Play) or just asking Siri. You can even use Amazon Echo or Google Home to control the connected device by just asking Alexa or the Google Assistant. 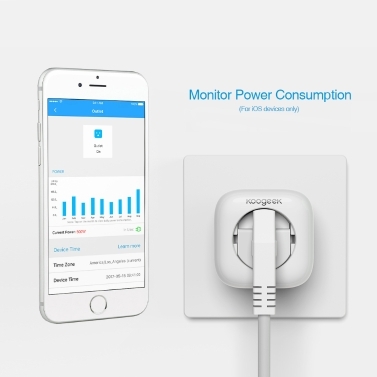 For iPhone, iPad, iPod touch only: you can set timers, monitor power consumption, control multiple HomeKit-enabled accessories simultaneously and automate your accessories. 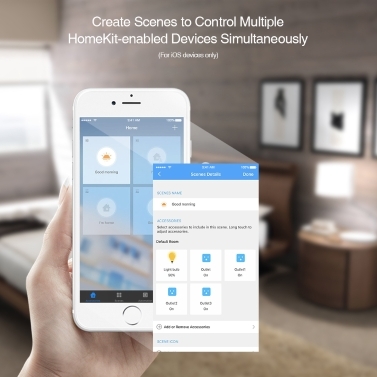 Apple HomeKit technology provides an easy, secure way to control HomeKit-enabled accessories using the Koogeek Home app (Apple Home app) and Siri on your iPhone, iPad, iPod touch, or Apple Watch. It is also compatible with Alexa and the Google Assistant, so you can use Amazon Echo or Google Home to control connected accessories after configuration. "Hey, Siri, turn on the Light." "Alexa, turn on the Light." "Ok Google, turn on the Light." Setup only takes a few minutes, no hub required. When configuring, use the Koogeek Home app to connect this product to a 2.4GHz Wi-Fi network. After successfully configuring Alexa or connecting to the Google Assistant, wherever you have Internet access (over cellular networks, e.g., 4G LTE / 3G, or any Wi-Fi networks), you can remotely control and monitor connected devices with either iOS devices or Android devices, whether you are at home or not. * Note: If Alexa or the Google Assistant connection is not configured, controlling HomeKit-enabled accessories from your iOS devices over your cellular networks or other Wi-Fi networks requires your Apple TV or iPad set up as a home hub. 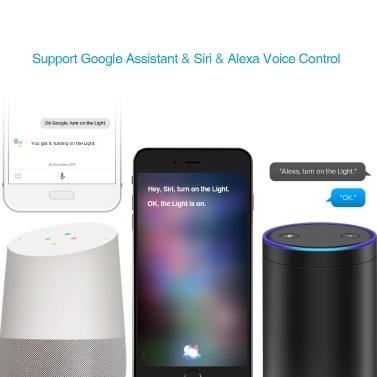 After successfully configuring Alexa or connecting to the Google Assistant, the ON/OFF status and control of connected devices are synced and shared across iOS devices and Android devices. Set custom schedules and timers for a device or a scene. It will turn on or off one or more devices at a specific time automatically. Create personalized scenes to control multiple devices simultaneously with a single Siri voice command, a schedule or simply a tap. 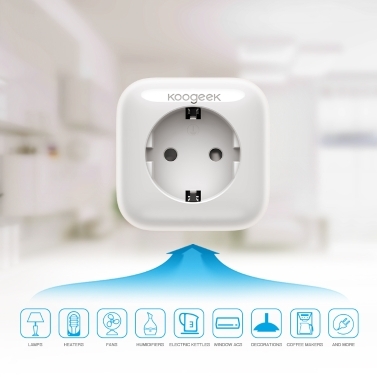 Check whether your Smart Plug is in use and monitor real-time, daily and monthly electric power consumption. 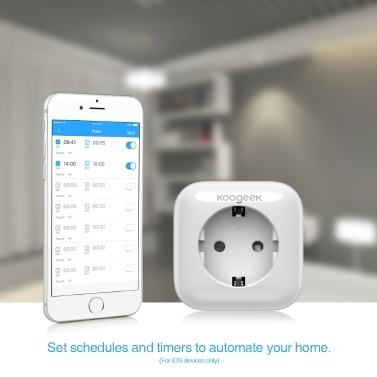 With the Koogeek Home app and on the same Wi-Fi network, without setting up any home hub, you can automate connected devices or scenes to turn on or off through triggers such as time of day, HomeKit-enabled sensor detection, or the action of a HomeKit accessory. You can set up your Apple TV 4K, Apple TV (4th generation or later, with tvOS 10.1 or later) or iPad (with iOS 10.1 or later) as a home hub, and remotely control your HomeKit accessories wherever you have Internet access, grant access to the people you trust and automate connected devices or scenes to turn on or off through triggers such as time of day, location, HomeKit-enabled sensor detection, or the action of a HomeKit accessory. - To control this HomeKit-enabled accessory with your iPhone, iPod touch, iPad or Apple Watch, iOS 9.0 or later is recommended. - To set up automations and user permissions for this HomeKit-enabled accessory with your iOS device requires an Apple TV 4K, Apple TV (4th generation or later) with tvOS 10.1 or later or an iPad with iOS 10.1 or later set up as a home hub. - To control this product with your Android device, Android 4.3 or later is recommended. - To control this product with Alexa using your voice, an Alexa product is required. - To control this product with the Google Assistant using your voice, Android 6.0 or later, or iOS 9.1 or later is required. 1. Some functions are currently not available on Apple Watch. 2. You can control connected devices by asking Alexa in English (U.S., CA, U.K., and IN), French (FR and CA), Japanese, or German. 3. You can control connected devices by asking the Google Assistant in English (U.S., U.K., CA, IN, and AU), French (FR and CA), or German.